Patios no longer have to play host to folding lawn chairs or the heavy wrought-iron bistro ensembles of past generations. They have become an extra living room or dining room, a prime place to relax and entertain—with the added bonus of fresh air. And they can be outfitted with the same attention to style given to interiors. The new outdoor furnishings on the market today, with the ability to withstand the elements and provide just as much comfort as our indoor pieces, are no doubt driving this trend. People are choosing large dining sets, or a sofa and chairs—and sometimes both, if there is room. Willard says that “motion pieces,” such as swivel rockers and gliders, have become just as popular outside as they are inside. Whether for dining or lounging, outdoor furniture is being manufactured to last through many seasons of wear and tear, even from that pesky guest called bad weather. “Everyone wants something that is low maintenance and long lasting,” Vaughan says, noting that aluminum or cast aluminum is a great option because it will never rust. Teak is always a classic because there is little to no maintenance and it lasts a very long time, she says. Then there are newer “green” options, such as “plastic lumber,” which uses raw materials mostly derived from post-consumer bottle waste, such as milk and detergent bottles. This product requires no waterproofing, painting, staining or similar maintenance when used outdoors. Willard is also a fan of furniture made with wrought aluminum and cast aluminum frames, which is very durable, heavier, and has replaced the old wrought-iron furniture from years ago that would rust quickly. But the most popular material in the industry, she says, is synthetic wicker (or all-weather wicker), known to resist rot and mildew. “It’s a big step from Grandmother’s old white wicker that sat on the front porch and had to be painted every year,” Willard says. Another benefit for all-weather wicker, teak and plastic lumber is that these materials do not get hot to the touch when the sun bears down. If you choose aluminum, though, that’s where today’s cushions help out. “Outdoor fabrics have come a long way in the past 10-plus years,” Vaughan says, pointing out that solution-dyed acrylic fabric is used in cushions now. It is colorfast, fade-resistant and easy to clean. While most furniture sets are sold with cushions, Vaughan says she takes a lot of special orders for cushions as well. Many people want their outdoor area to coordinate with either their indoor style or with colors they have already chosen for their outdoor décor, she says. Some simply want to replace their old, cheaper cushions and take advantage of the heavy-duty materials being manufactured today. Talk to any furniture dealer or interior designer and the product that will be mentioned most in terms of outdoor cushions is Sunbrella. “It is taking over the industry and being used by many manufacturers on indoor furnishings because of its durability,” Willard says. Sunbrella fabric is water-resistant. 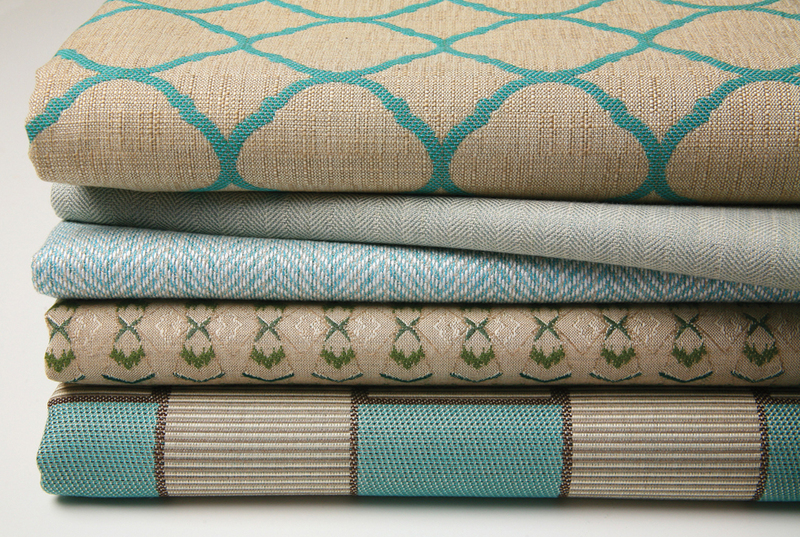 The brand also makes Sunbrella Rain, a completely waterproof version of the legendary upholstery fabric. It is available in solids, stripes, and prints of all hues and designs. Cushions are also getting more comfy. If those sofas, love seats, and large chairs weren’t displayed next to the patio umbrellas and yard décor in the store, you may not even know that they are meant for the outdoors; they look like they could easily belong inside. 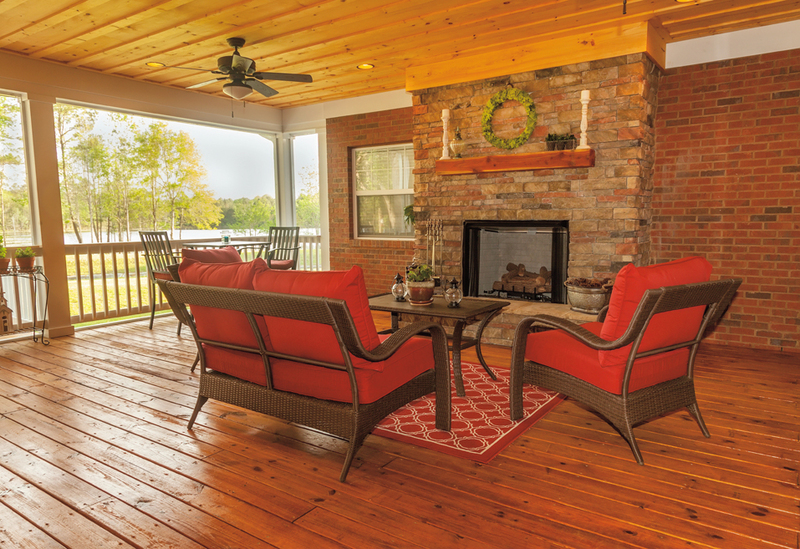 Even though outdoor furniture has come a long way in its durability, Vaughan and Willard say choosing sets from a reputable furniture line is the best way to ensure you are getting a long-lasting product. 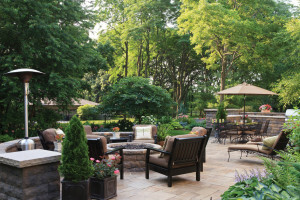 “As everyone is aware, you can purchase outdoor furnishings just about everywhere, from the grocery store to the gas station; however, there are considerable differences in purchasing quality outdoor furnishings that will last for years,” says Willard. Retailers and interior designers carry top lines like Summer Classics, Lane Venture, Brown Jordan and Kingsley-Bate, to name just a few. Like any investment, proper care will keep your outdoor furniture looking its best. 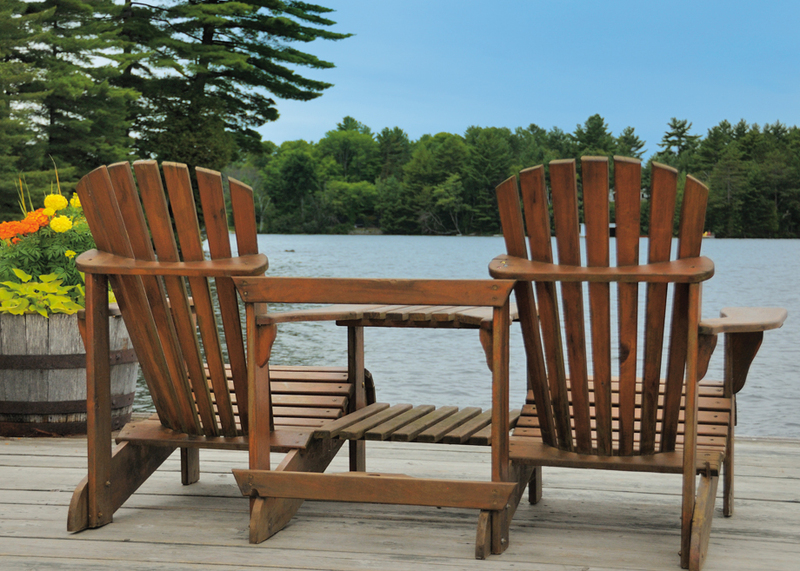 Slipcovers can prove very helpful during the winter. 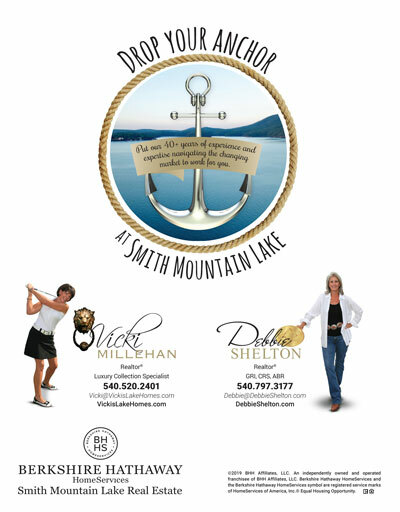 Vaughan recommends a neutral-color cover that is waterproof, yet breathable for the humidity, and machine washable. 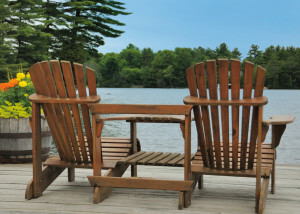 Many homeowners at the lake turn their docks into living spaces. Ginnie Vaughan of National Pools recommends purchasing heavier materials for outdoor furniture for this location, such as cast aluminum, wrought iron, steel, and plastic lumber, made from recycled materials. Typical aluminum is lightweight and could blow away easily. Plastic lumber is ideal because if it ends up in the water, it floats. Teak is also a great option because it is heavy and requires low maintenance.